Friday is a good day. Today is an especially good Friday! 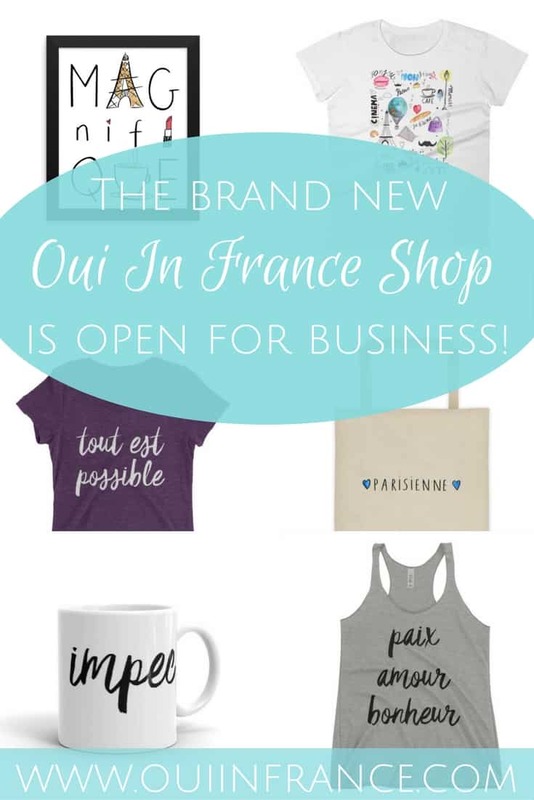 I’m so excited to tell you about the new and improved Oui In France Shop! : :: ::: cuts virtual grand opening ribbon ::: :: : Version 2.0 went live this morning and I hope you’ll check it out. There are a few changes — and new products! — that I’m so pumped to tell you about. Eeeeepp, I can hardly contain myself! 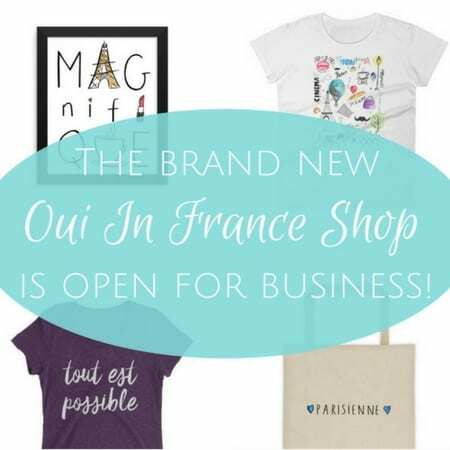 As many of you know, I launched the Oui In France Shop at the end of 2016 offering a limited edition collection of Francophile t-shirt and tote bag designs created by me and brought to life with the help of a local artist. Because I was just getting started, it was difficult to offer a bunch of designs and styles, maintain an inventory, and handle the packing and shipping myself. After 6 months of running my shop, I realized I needed to make some changes. I wanted to offer my customers more than just 1 style of white t-shirt and a limited number of designs. At the same time, I wanted to make the process easier on my end and try to bring down shipping costs. So first, the basics. Here’s what has stayed the same: high-quality custom designed t-shirts and tote bags that you can’t find anywhere else that ship worldwide. 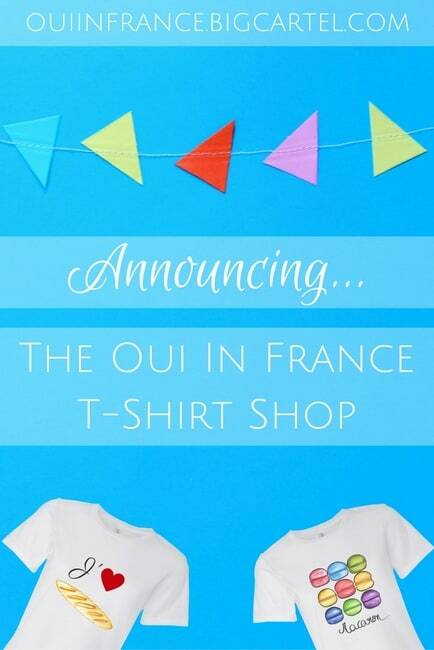 What’s changed about the Oui In France Shop? 1. 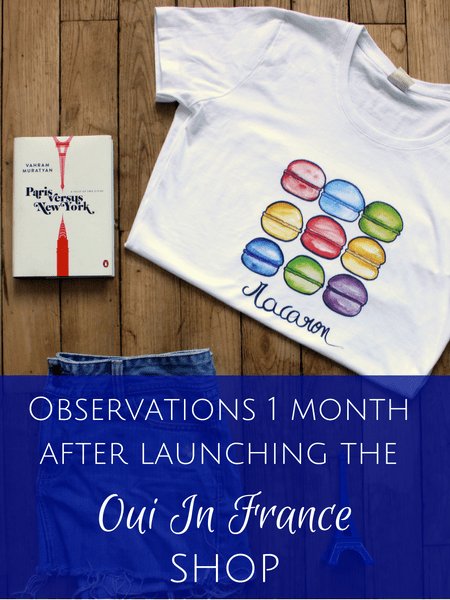 The shop is now part of my main site so you can shop right from the Oui In France blog. 2. I have a bunch of new designs and products including 2 t-shirt styles, a racerback tank, mugs and wall art. 3. Products will ship from the USA for my North American customers making shipping costs more affordable. I’m using a fulfillment center to help streamline the process on my end. The first big change is that my shop has now been integrated into my main site. You can head to the shop by clicking here or scrolling up to the top menu above my logo and clicking SHOP. It was also important to me to offer a new collection of products (and shirt styles) that were more aligned with my personal style aesthetic. 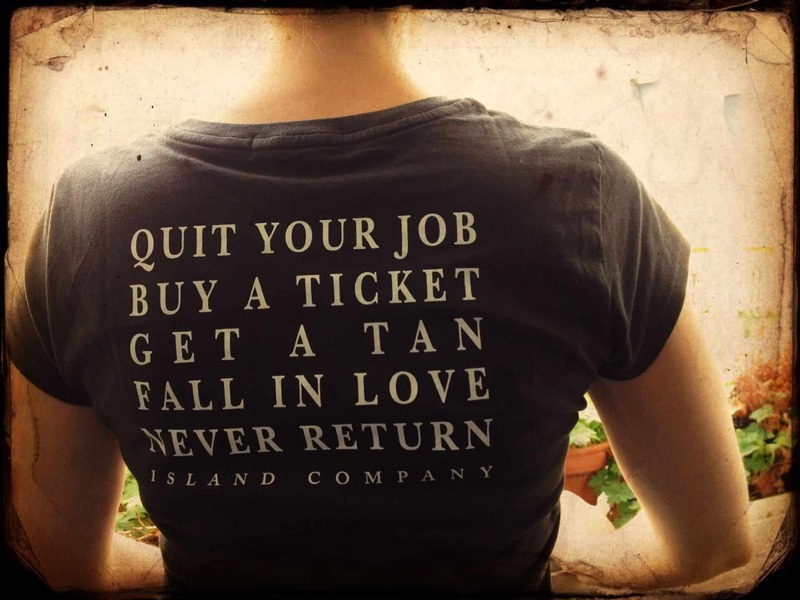 I think colorful designs on white t-shirts are great, but they don’t appeal to everyone — and I knew that going in. It’s just hard to offer everything you want to offer when you are just starting. On a personal note, I don’t even wear white t-shirts that often and I wanted to figure out a way to bring something new to my shop that was more “me.” That’s why I’m so thrilled to be able to unveil my Word Collection which features French word designs in a variety of color options. I’m a minimalist when it comes to fashion and clean script lettering on a soft charcoal gray vintage t-shirt is right up my alley. By creating a collection that aligns with my personal style in a variety of colors, I feel like I’m bringing a more authentic offering — not designs that I like but ones that I actually love to wear as well! There are 6 Word designs in the collection (6 with black lettering and 6 with white lettering). Impec: This is one of my favorite ways to say you’re doing great in French. It sure beats a ho-hum ça va response when someone asks you, “Ça va ?” Impec is short for impeccable! tout est possible: This means “anything is possible” and it’s the truth. paix amour bonheur: This translates to peace, love and happiness in French. 3 very good words to wear proudly. You can view the Word Collection on the everyday t-shirt here and the Vintage T-shirt style here. Be sure to click a specific design to see color options. 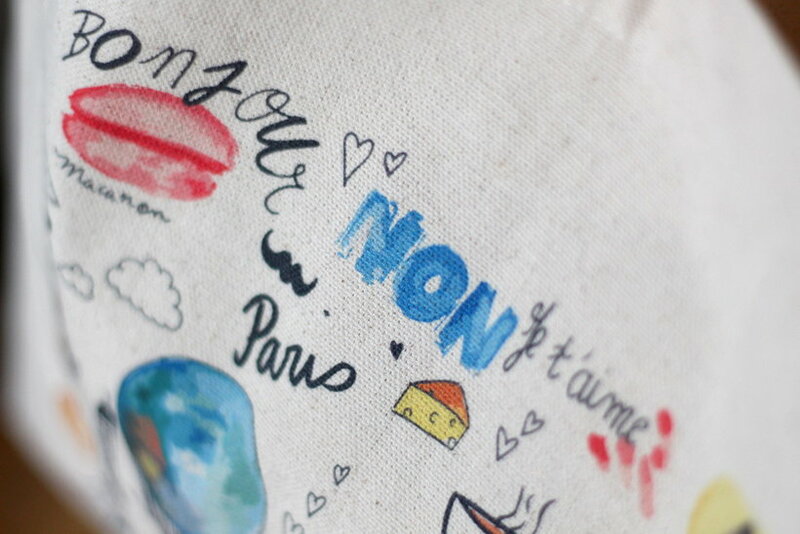 You can check out my Francophile designs on the everyday t-shirt here. In addition to the Word designs, what else is new? I’ve added mugs and wall art to the shop. And I’ve also printed some of the old designs on new shirt styles. You can now get the Francophile Scene on a t-shirt and tank top. 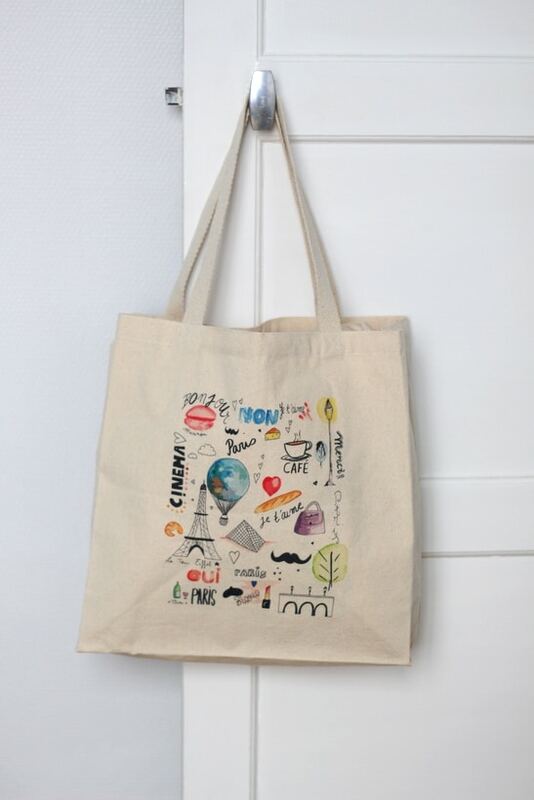 It’s also back in stock as a tote bag (shown below)! There’s also a Parisienne design as well as a Magnifique one. The tote bag style ($19) is a little different now as well. It’s still super sturdy but is slightly bigger and has a reinforced bottom. In terms of the shirts, I now offer a racerback style (thin, body-skimming fit) as well as a vintage style t-shirt for the Word Collection (super soft, thinner material, on the longer side, body-hugging fit and RUNS SMALL so size up!!) and of course a regular everyday t-shirt (same type of regular fit as my t-shirts in my original shop, but slightly thinner cotton). You’ll see a bunch of new color options, too. Please view my sizing guide in my FAQ here before ordering. 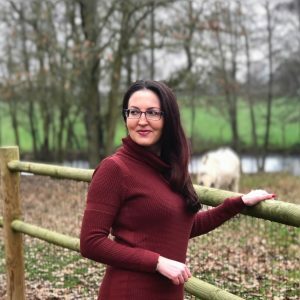 In my sizing help section, I have pictures of real customers along with their sizes to help you order the size that works for you. As I mention below, all orders are custom printed so I cannot offer returns or exchanges. Please be sure to review my sizing guidelines and email me if you need help! To help streamline the process on my end and offer you more options as well as cheaper shipping, I am now using a fulfillment center that has operations in the USA and Europe. This means that I am no longer printing everything locally and shipping orders personally. Having a fulfillment center means I don’t need to stock an inventory. It also means shipping charges will be super reasonable. Shipping will be several dollars cheaper than what you would have paid if I shipped you the item(s) from France. 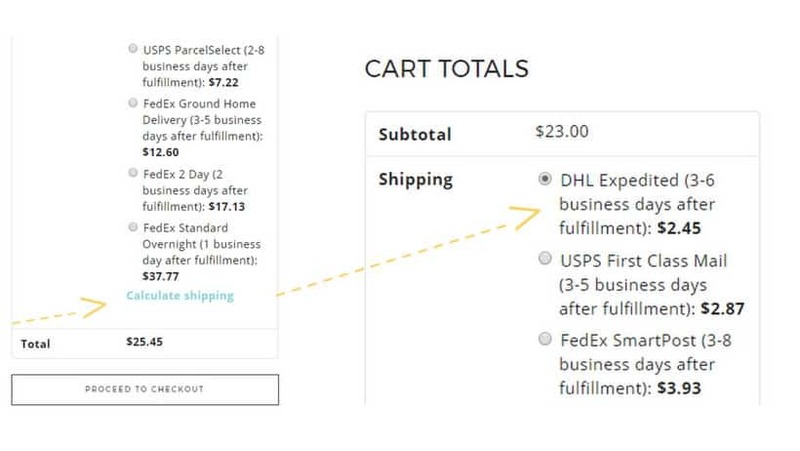 Shipping is calculated by weight so a shirt shipped within the US is only a few dollars. Any order with a mug will cost more to ship since it’s heavier. To get real-time shipping rates, click “calculate shipping” in blue at checkout as shown below and hit UPDATE once you enter your country and state to get real-time rates. In my example, the cost of shipping 1 shirt to Florida is only $2.45. Something else I want to point out is that the fulfillment center has a European warehouse so many of my products can also be fulfilled in Europe for customers in Europe or at least closer to Europe. Please note that mugs and vintage t-shirts are only available from the USA fulfillment center at this time. Regardless of where you live in the world, I can ship to you and prices are reasonable. 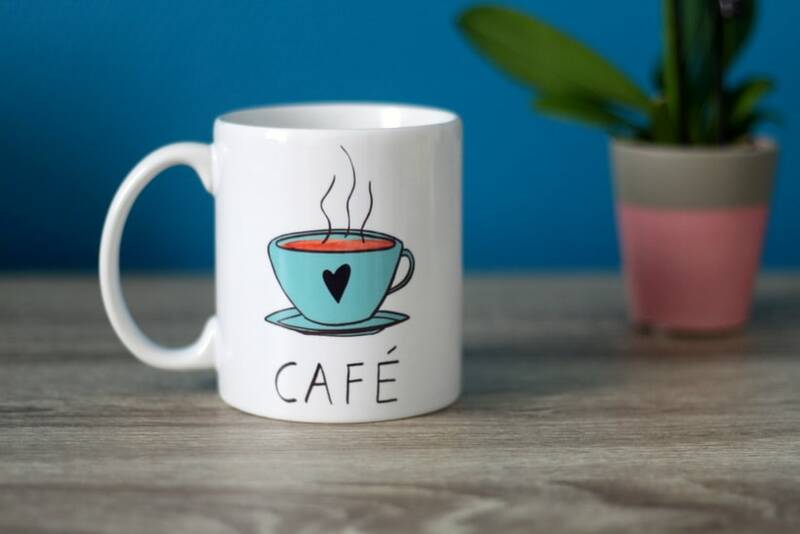 I’ve ordered numerous samples of my products and am so pleased with the quality of the items themselves as well as the printing and I know you will be too. Because all of my orders are custom printed after the order is placed, I can’t offer returns or exchanges (except in the case of damaged or defective items), so please read the sizing help section of my Shop FAQ here. I’ve done everything I can to describe my products in detail and even have real customers modeling my shirts so you can get a sense of sizing. Also, please keep in mind that the average order fulfillment time before shipping is about 3 business days (but can take up to 5). Everything is custom printed as orders come in, so I appreciate your patience. If you need your order more quickly, there are upgraded shipping options. Please review the sizing guidelines before ordering! Thank you for your support. A share on this would mean a ton to me, even if you aren’t able to shop! Well done and good luck. My favourite is Tout est possible, Love it. T’other Diane. I’m on the desktop version now, looks great Diane! How wonderful! The designs are so fresh and clean, delightful!